Q. Why was 6 afraid of 7? A. Because 7 8 9! Fill in your answer on the form at the bottom of the page. Take ten cards numbered 0 to 9. 1. Pick three cards with a total of 12. You can do this in 10 different ways. Write down the combination of cards you used. 2. Now pick four cards with a total of 12. How many different ways can you do it? 3. Can you select five cards with a total of 12? A pandigital sum (for addition, subtraction, multiplication or division) is one which uses all of the digits 1 to 9 once and once only. and there are many more like that. Find TWO other pandigital sums. A Magic Square is set of numbers arranged in the form of a square so that the total of every row, column and diagonal is the same. 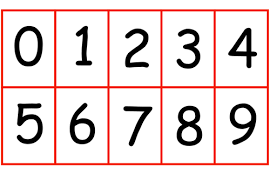 On the right is a Magic Square with 3 rows, 3 columns, and 2 diagonals, so that there are 8 totals to be found, each of which adds up to 15. 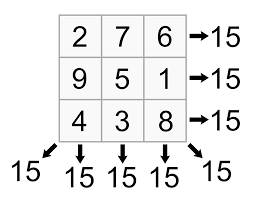 An Anti-magic Square has the same arrangement but the total of every row, column and diagonal is different. Use the same numbers (1, 2, 3, 4, 5, 6, 7, 8 and 9; once and only once) to make an Anti-magic Square with the added restriction that none of the 8 different totals must be less than 10 or greater than 18.